Revelstoke is experiencing a housing boom this year, with at least 26 new homes being built in town. Aspen Crescent in Upper Arrow Heights is the site of a building boom. Until recently, Aspen Crescent, at Hay Road and Nichol Road in Upper Arrow Heights, was a mostly barren sub-division. It was developed alongside the ski hill but for a few years, only a few homes were built. Most of the land sat cleared of trees, waiting for homes. The homes have come. The neighbourhood, which consists of Aspen Crescent, Poplar Lane and a block of Hay Road, is a hive of building activity, with large homes going up on a variety of lots. There’s a mix of construction going on. One house was being built by local contractor Jordan Cochrane Construction. Another was being built by a father and his two sons. Yet another was a spec home being built by a certified builder. I was there to visit Sophie Fortin and Troy Kirwan, who moved into their brand new modular home last month, but I met many other new home owners. 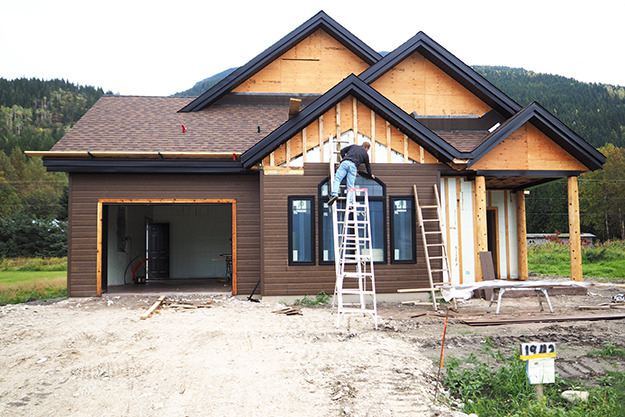 Aspen Crescent is the hub of Revelstoke’s new home building but the building boom is taking place around town, with 26 building permits issued for new homes so far this year, and more coming in every week; three more were being processed last week. “We could hit 30,” says Dean Strachan, the City of Revelstoke’s manager of development services. As I reported in June, the boom in new construction is being driven by a variety of factors. The market for existing homes has dried up and prices are rising again. As well, many homes on the market need substantial renovations, making it more desirable for people to build new homes rather than buy and renovate. According to City of Revelstoke statistics, the building permit value of new homes range from only $70,000 all the way to $3.8 million. They have a total value of more than $10 million. If you ignore the $3.8 million home, which skews the numbers, the average new build value is $272,891, while the median value is $283,000. The big home raises the average to $408,549. Those figures don’t include the cost of the lots. A range of people are building, from young couples to families to “lifestyle retirees,” says Strachan. Sophie Fortin and Troy Kirwan recently moved back to Revelstoke. They had lived here before, when Fortin owned the Woolsey Creek and Kirwan was a helicopter pilot, however a few years ago they decided to move to Invermere to start a helicopter business there. Everything changed when Kirwan was diagnosed with ALS, a neurological disease that attacks the nerve cells responsible for controlling muscles. 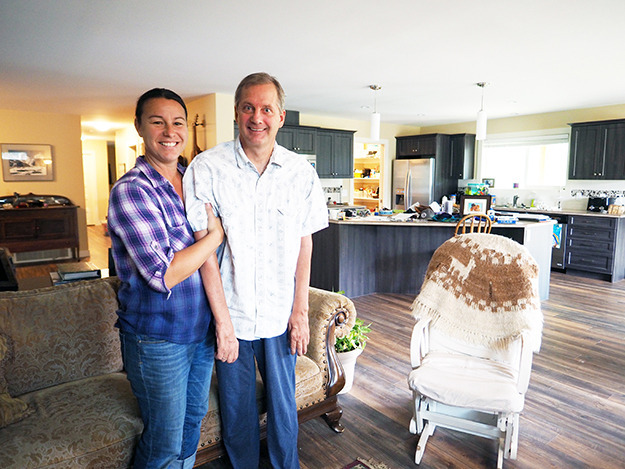 They decided to move back to Revelstoke with their young daughter, but they also needed a home that suited Kirwan’s needs. He can move around slowly with a walker, but mostly he uses a wheelchair to get around. He needs permanent care, a role Fortin is fulfilling at this point. It was with all that in mind that they went house hunting. “Looking at what was in town, it was a lot of fixer-uppers, which we didn’t have the energy or the money to do, and everything needed to be fixed, so you might as well start from scratch,” said Fortin. They purchased a lot on Aspen Crescent and looked at building from scratch, but decided against that because the process would have been a lot more demanding. They decided to go with a custom modular home from Freeport Industries, which is based in West Kelowna. They wanted a home that was accessible for Kirwan, with everything on one floor, big doors, and wide open spaces. To build their home, they met with the company and went back and forth with the designer on their needs. Everything from the paint to the light fixtures to the kitchen cabinets were included in the build, and they were able to choose based on their budget. Steve Lagace seemed confused when I asked why he was building a spec home. As a licensed home builder, it’s what he does. In Revelstoke he stands out since in recent years the vast majority of new homes are owner built. Spec homes are few and far between. “I don’t understand why I’m the first one to build a spec house,” he said. Lagace was building next door to Fortin and Kirwan. He climbed off his ladder, where he was finishing the siding of his house. The home is about 1,800 square feet and has three bedrooms on two floors. He started building on July 5 and the exterior appeared mostly finished last week. 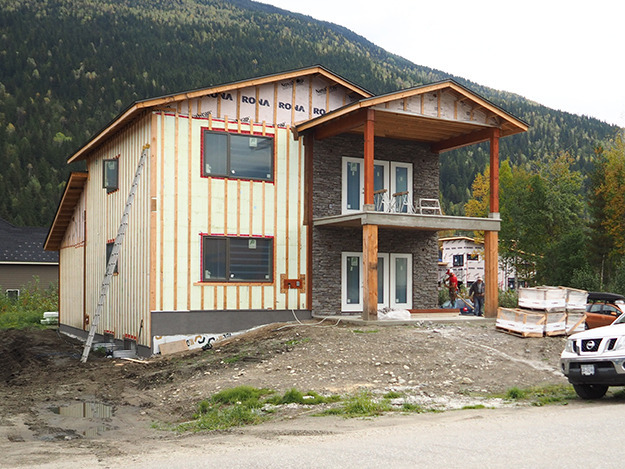 This is the ninth home he’s built and the second in Revelstoke; last year he built one on Hay Road. He expects to finish building at the end October, and doesn’t anticipate having any trouble selling. “I’ll build one every year if I can, if the lots are available,” he said. Before meeting Lagace, I hadn’t heard of any spec homes being built in town since Peter Bernacki built his skinny house near the Courthouse in 2013. Dean Strachan, from the city, said there’s a few spec homes being built this year. Down the street, at the corner of Aspen Crescent and Hay Road, Joel Fafard was building his new home with his brother and father. Fafard has lived in Revelstoke off and on since Revelstoke Mountain Resort opened. He works in the oil industry and finally decided now was the time to build. The key for him was having enough storage space for all his toys. With that in mind, the home he designed has a big garage and basement. “I wanted enough garage space to store all my (stuff), and a basement to store the other (stuff) that takes up less room,” he said. The house has two apartments — a two bedroom suite upstairs and a three-bedroom suite on the main floor and basement. “Those are really small rooms. Everything is pretty compact because I wanted to keep the size down and keep it somewhat affordable,” Fafard said. While he isn’t a home builder, his father and brother are both experienced. They previously built his father’s house together. “This one, because I thought about everything and I’m doing a lot myself and making all the choices, it takes a lot of time,” he said. He bought the lot last August and poured the concrete on April 1. He’s hoping to move in this winter. “Finished is not going to happen. I’m hoping it’s going to be livable in January,” he said. Geoff Stewart was close to building a modular home. The 32-year-old has lived in Revelstoke since 2009 and finally decided he was settled enough to make it his permanent home. He started looking at the housing market seriously about a year ago, but it soon became evident to him it would be more worthwhile to build something new than to buy and renovate. Instead, he looked at properties for around $100,000 and looked at his options to build. What he wanted was a small, three bedroom, two bathroom home that would allow him to have roommates to cover the cost. He found a property in the Big Eddy that fit his price and was looking at a modular home before he started talking to Greg Hoffart from Tree Construction about a custom build. They were able to come up with a design that fit Stewart’s wants and budget. “We’re going with a super simple shape, with modern efficiencies and style,” he said. When I spoke to Stewart last week, they were still going through the permitting process. He said he was happy to go with a local builder who shared a similar lifestyle, as opposed to going with a modular home.